Driving to work recently, we found ourselves on speaker phone, recalling the places we had worked that were particularly good at engendering trust, fostering collaboration, driving innovation and managing risk. “There can’t possibly be that many places like that,” you may be thinking. And you’re right. Trust. Risk. Collaboration. Innovation. All of these go hand-in-hand and their abundance – or dearth – reflects an organization’s culture.All too often, organizational culture is created by accident – a jumble of publicly stated imperatives that are out of sync with the way work really gets done and what is truly rewarded in an organization. We call this an “accidental culture” as opposedto an “intentional culture” which is deliberately created to further an organizations values, goals and capabilities. Leaders spend days in off-site meetings writing values and mission statements, but few actually stop to reflect on how work actually gets done, how decisions are made, what gets rewarded and who gets promoted. In other words, few take the time to grasp and articulate the true culture of their organizations. It is important to note that we are not suggesting that leaders embark on a mission to drastically change the cultures of their organizations – this would be too difficult and may not even make sense. Rather, we are asking leaders to think about the extent to which their key players have a realistic understanding of the culture that is already in place. The decision to make cultural changes is then based on whether business goals are being met and whether cultural shifts are needed in order to meet those goals. Both John Kotter and Edgar Schein write extensively about this. True culture defines the extent to which diversity is valued, how failures are managed and what behaviors are rewarded. More often than not, an organization’s culture comes into existence accidentally and seldom aligns with the way the organization describes itself through publicly stated values and mission statements. While some leaders do deliberately set the tone and build an intentional culture that trickles down through the organization, most have not examined the extent to which the true culture of their organizations aligns with the publicly stated culture. If they have done so, then it is likely that they have not effectively addressed any misalignments between the two. For example, an organization that outwardly says it values innovation, but in reality shows little tolerance for risk – a key ingredient of innovation – suffers from a mismatch between its true and stated culture. This “accident” can be rectified only after it has been acknowledged, and when leaders become clear and intentional about shaping the culture. 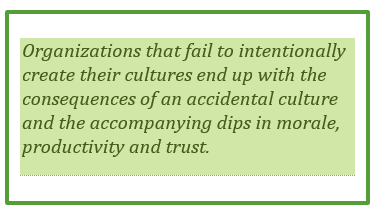 Organizations that fail to intentionally create their cultures end up with the consequences of an accidental culture and the accompanying dips in morale, productivity and trust. So why do so many companies fail at creating the culture they talk about? Open acknowledgement of the gaps between true and stated culture, courageous conversation around why those gaps exist and deliberate action to narrow the gaps can help avoid a tumble into an accidental culture that ultimately may not be what the company wants. It is the onus of top leaders to be aware of which behaviors, people and attitudes they actually reward because this information enables them to intentionally define their organizational culture. Outcomes are defined and people are accountableHere are some questions that can help uncover the gaps. Be sure to solicit feedback from people at various levels and in different functions, encouraging honest conversation and multiple viewpoints. Do people feel a sense of inclusion and being part of a team? How do you define “trust”? Is there a consistent understanding of what this means within your organization? Is there enough trust to foster honest dialog without fear of retaliation? Are diverse life experiences and cultural backgrounds leveraged as an asset, or just tolerated? How do you know? Are people encouraged to share opposing viewpoints? What kinds of risks are encouraged? How is failure treated? Under what conditions is it okay to fail? Is it safe to examine mistakes openly and learn from them as a team? Do you focus on what went right or what went wrong? Is creative thinking built into the way you manage processes and projects? 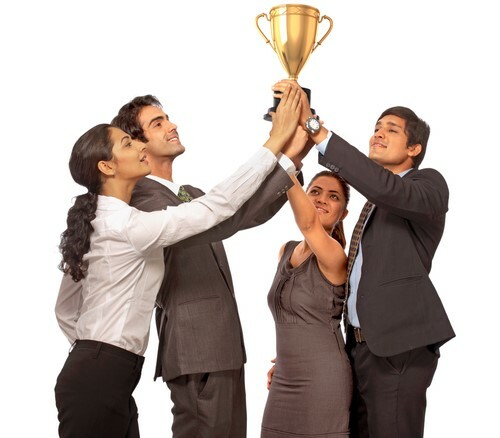 Are teams unified in organizational, departmental and company-level goals? How effective are inter- and intra-team collaborations? Is collaboration limited by silos? Is accountability and discipline built into the way you do business? Do people do what say they are going to do? Don’t find yourself in an “accidental culture.” As a leader, it is up to you to demonstrate courage and take action when there is a misalignment between the culture you want and the one that you have. Create your company’s culture purposefully and intentionally and watch morale escalate, talent thrive and innovation take root as never before. 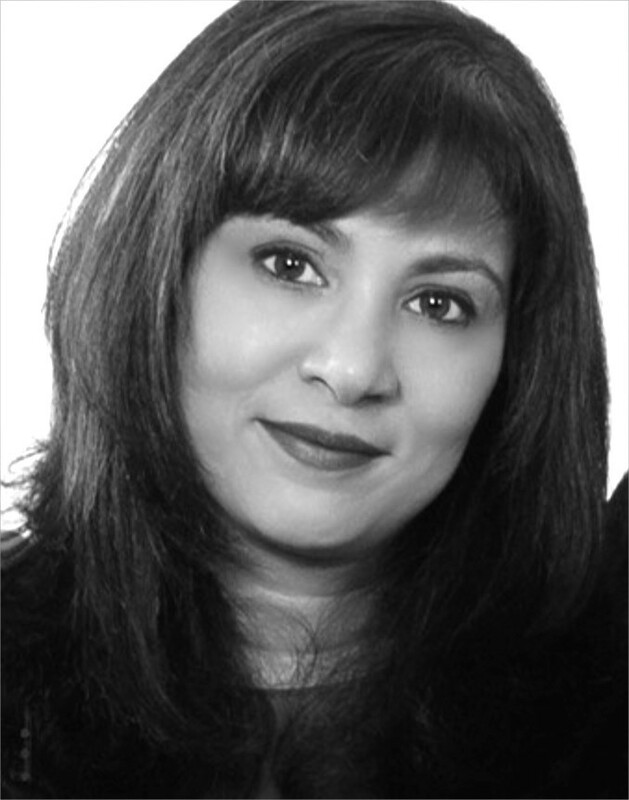 Sangita Kasturi brings deep insight to the areas of change leadership, inclusion and cultural intelligence. She has expertise with organizations globally, building capacity by helping leaders implement changes, communicate powerfully and maximize diverse talent. She is passionate about helping women and minorities acquire career accelerating skills. 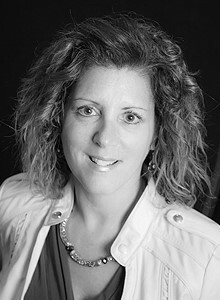 Jami Donohue brings passion and experience to organizational operations and helps drive organizational success through the right structuring and melding of people, processes and tools. This translates into having a solid change strategy, communication/change management plan and the methodology to pull it all together. She is driven by working with people to help organizations effectively manage change. 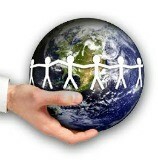 Learn more at www.RAOSolutions.net.